I’ve got a large amount of drunken chicken sauce left after trying Alvin’s recipe. I wonder how I should do with this leftover. I didn’t want to waste it, nor felt I had drunken chicken enough. So, I decided to make a second round of drunken chicken. This time I used chicken legs only and made it as an appetizer. This dish was served cold with sour and sweet cucumber. The texture of the chicken skin was smooth and the meat absorbed all the sweet wine flavours. It can be served as a refreshing appetizer in summer, or a side dish for meat lovers. 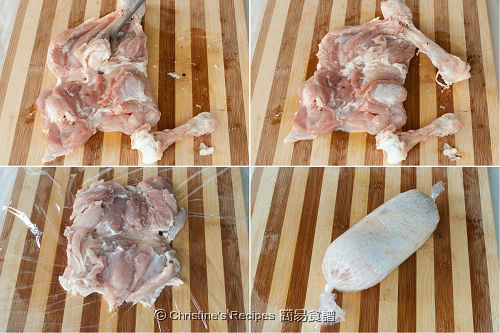 Rinse chicken legs and wipe dry with kitchen papers. Use a sharp knife to remove the bones inside. Or you might ask your butcher to debone for you. Keep the skin intact. Sprinkle salt and pepper on both sides. Wrap the chicken with cling film. Tie a knob on both ends (I learned this on MasterChef). 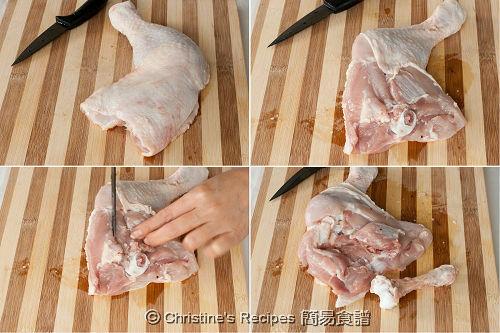 Repeat this procedure to wrap the rest of the chicken legs (as the above pictures shown). Place the chicken legs in a wok/steamer with boiling water filled. Steam over high heat for 20 minutes, or until cooked through. Remove the chicken from wok. Let cool down. Heat drunken chicken sauce and bring it to a boil. Remove from heat and let cool down. Add more Shaoxing wine when it cools if necessary. Taste by yourself. Place the chicken in the sauce. Cover and chill in fridge for at least 6 hours in order to let the chicken absorb all the flavours of the sauce. To serve: remove chicken from fridge and the sauce. Slice thinly. Ladle source over the chicken. Served cold with sweet and sour cucumber or any salad you like. Use the good quality cling film that can stand for high heat preferably. Or use foil to wrap the chicken instead. If you haven’t got any drunken chicken sauce left, you might like to cook some for making this dish. Refer to the previous recipe for making the sauce. Use half of the amount of all ingredients or adjust the amount proportionally according to the size of your container used for chilling. Make sure that all chicken legs can be completely covered in the sauce. Or simply get a ready-made drunken chicken sauce from any Asian grocery stores. Follow the instructions of the product to prepare the sauce for soaking chicken. 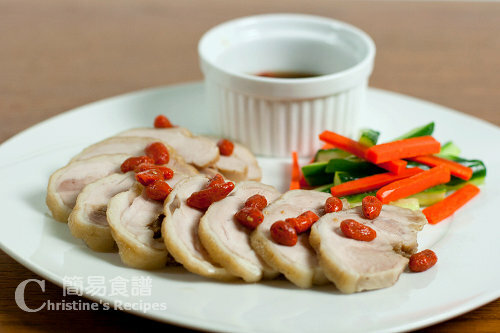 The leftover sauce can be stored in fridge for a few weeks, and served as dipping sauce for other dishes. This is such a clever way to poach chicken! You are really skillful with the knife. I must learn how to debone as well. I seriously didn't expect a chicken leg could have looked so elegant and delicious! Christine, so impressing on your debone skill, I can nvr do tat. The chicken dish looks like restaurant serving, so well presented! I love drunken chicken and your dishes here all look like restaurant qualities. Thumbs up! This chicken looks fantastic, beautifully prepared and presented! I like how you debone the chicken and thanks for your tips on getting such beautiful chicken leg slices. Cool! Love the title of this recipe, drunken legs! I think I'm already quite drunk looking at it...haha....drunk and drooling. Love the chicken. Looks so neatly cut and arranged...like restaurant style. 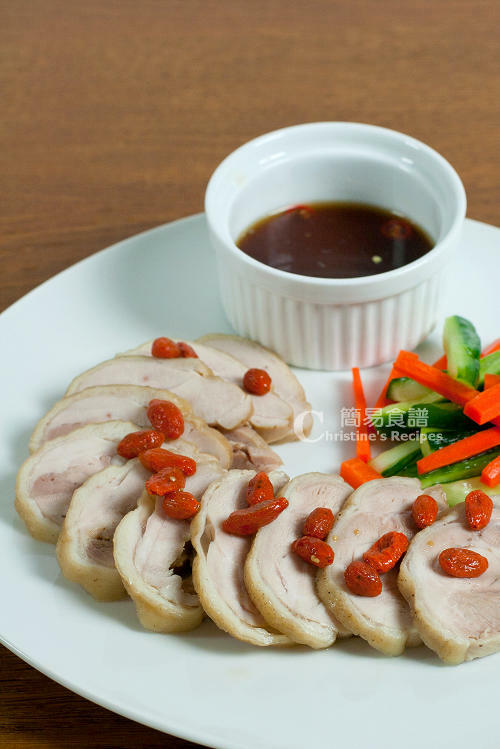 This is a creative way of preparing drunken chicken, isn't it?! Christine you've deboned your chicken so well! Well done on the drunken chicken leg recipe - so much easier than trying to pick through the chicken bones. This dish just looks so tasting - I want to try both recipes side by side, cannot wait to give it a try. I admire your deboning skill! Very well presented. I've done the boned thighs wrapped in plastic (though my boning was anything like as neat as yours!) and I've made the drunken chicken. I'm wondering if it would work to wrap the thighs in cheese cloth and poach them in the drunken liquid so that they absorb the flavor? May have to try that. I guess so. You might try cheese cloth to wrap and poach chicken. But I'm afraid the sauce won't be easy to infuse into the meat. It could soak up all the goodies in the sauce instead.